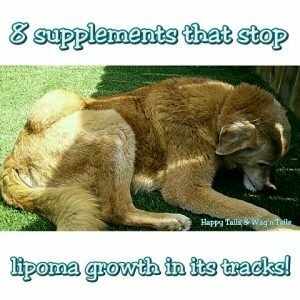 Natural remedies to shrink dog lipomas! If you have ever been told you can not naturally reduce or shrink your dog’s fatty tumor and surgery is the only option, this is for you! The truth is you CAN reduce lipomas! Since writing my last blog, the cancer blog, I have learned some new information from a pet health seminar that you have may have never heard of before! I know lipomas can shrink because I saw my dog’s lipoma shrink to almost nothing. Look at my cancer blog, do you see a lipoma on my dog, the black lab? I’m guessing no because it was impossible to see and sometimes I had a hard time finding it by touch. Yet I know how big they can grow as I saw my furry friends grow (See below pic – German Shepherd mix with large lipoma above his rear back leg). Also, I have confirmed many of the supplements I suggested are listed in this book. Additionally, I am continually reading pet health information, attending seminars, watching documentaries and continuing my education – currently to be a canine herbalist (see image-badge at the bottom of my website) in order to share what I have learned with you. Finally, I researched many of the products I suggest to ensure quality products. Please note: buying something similar to what I recommend may not produce the same results. Not all supplements are created with quality ingredients which is why I suggest certain brands! Furthermore, some contain ingredients I don’t like which is why I will not recommend them. Lipomas are fatty growths or masses also known as benign tumors or non-cancerous lumps and bumps. For many dogs, they may not appear until later in life. However, I have known a dog who had one appear at 2 years old. The bigger question is why is this becoming so prevalent now when it was not years ago or even seem normal and acceptable? Here I will discuss the causes and how to shrink or prevent lipomas. At the first sign of a lump and bump, go to the vet to have it aspirated. Aspiration is a simple procedure where they insert a needle in the lipoma to draw out some fluid for testing. I Do NOT recommend letting them cut your dog, biopsy it or do surgery, right away. The ONLY time surgery should be done is if it poses a health issue! Furthermore, some vets & dog owners have reported that after the lipoma has been removed, another lipoma or several more appear. Why is that? I think of Lipomas like weeds in the respect that if you don’t remove the roots and change the environment, they will come back. Vets who look at pet health from a holistic point of view believe lipomas appear because of all the chemicals they are exposed to from vaccines, processed food, and environmental toxins. Finally, some vet’s have associated vaccines and microchips with lipomas. Yes, microchips have been found directly under lipomas and ingredients from vaccines have been found in lipomas and tumors. I know of on instance of a dog having a tumor removed to find contained a foxtail. I covered this in my cancer blog in good detail. A quick summary is to give them filtered water to remove things such as fluoride and arsenic, utilize eco-friendly cleaning methods, get lead free dog bowls and use chemical-free flea treatment. 1) Outdoor chemicals: While we can’t control all chemicals like the ones that are sprayed in the air or those that come to your property because of neighbors using them, we can do a few things to protect our pets. 1b. If it’s possible to try to learn the schedule of when the community will be spraying so you can keep your pets indoors and out of any areas that have been freshly sprayed. 1c. Limit the time you allow your pets to walk on community grass. For example, I taught my dog “potty or off.” When you bring your pet(s) inside, you can wipe them down or soak their feet to reduce some of the chemicals they may have picked up during their walk or roll in the grass. 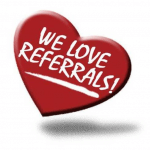 *I have seen clients dogs chew their paws after walking on the grass. Not everyone has a bowl or washtub designated for paw soaking so I have used a wet paper towel to wipe their dog’s paws. This has always reduced or completely stopped their chewing. 2) Clothes: as it turns out many of our clothes are treated with chemicals like formaldehyde and other cancer-causing chemicals. This makes me believe it’s possible for our pet’s shirts and sweaters may be as well. Even if your pet does not wear shirts, your clothes could be a source of exposure. I wash everything before I wear it. 3) Furniture and bedding: buy non-toxic bedding, wash bedding and pet blankets before using. For furniture, try to buy it without stain repellants, air it out before bringing it inside, wipe down furniture and put a blanket over it. As a reminder, I suggest certain brands because many products are not made with quality ingredients OR have counterproductive ingredients (Ex: natural flavor). 1) This herbal remedy helps with lipomas, getting rid of UTI’s, assists with Addison’s, *studies show it helps lower blood pressure and LDL (bad cholesterol), improve heart function and increases flexibility. Dosage guidelines for dogs and cats are on the bottle! 2) This herbal remedy is helpful for arthritis, oral health, shrinks tumors, is an anti-viral will help prevent the dog flu aka canine influenza! Dosage guidelines are on the bottle. Update Jan 2018: This remedy has multiple ingredients in it including turmeric, which is the most common recommendation by 30+ holistic vets for cancer. Also, I tried this remedy myself and it doesn’t taste bad at all. I thought I would share in the event anyone was worried their pet would not take it. 3) This herbal remedy is anti-viral, helps the immune and lymphatic system, and last but not least can be applied topically to lipomas. *This is not a pet specific version. As I continue to look for one, PLEASE NOTE you should NOT follow the label for dosing instructions. Dosage for dogs: 1 drop for every 2 lbs of body weight twice a day if taken internally. A good nutritional foundation will boost the immune system which should help prevent lipomas from forming or stop them from getting larger. 1) Vitamin C: is helpful in preventing and fighting lipomas, is essential for wound healing, good for heart health and eyesight, and cleanses the lymph system, blood, and liver. 2) Blue-green algae: is algae is rich in bio-available nutrients and a source of protein. It pulls out toxins that may be contributing to lipomas and eye issues, anti-cancer and helps skin & nails. It may help you to get your pet to stop eating grass (one customer reported that worked for her dog in the comments below). This algae works best WITH #3 green juice. *This bottle lasts me 6+ months. Algae Dosage: 1/8 tsp per 10 lbs with a maximum dosage of 1/2 tsp for a 70 lb dog daily. Add directly to food or make a “green drink.” REMINDER: start slow to make sure they like it and no “reactions” occur. Tip: I add a little bit of coconut water to make it more palatable and it is supposed to give it an extra “boost.” Fyi: not all coconut water tastes the same, I like this one and this one. CATS: I confirmed with a vet that cats can have this too! 2b. This is a dog-specific algae Bonus: If you have you used several of his holistic dog products and are seeing good results, you can enter to win a monthly contest to win free products. Dosage included on the label. 3) “Green juice”: it takes ahold of other toxins not grabbed by #2 and expels them from your pet’s body. It is high in chlorophyll, also helps with gut health/aids digestion, bad breath, kidney (renal) issues, eyesight, is a good way to introduce “greens” to your dog or cat and address any deficiencies. Administration: You can add some to their food.Dosage: I gave my 70 lb dog 1/2 tsp daily. ***Pet Liver detox: First thing in the morning, on an empty stomach, use #2 & #3 mixed with water and let your dog or cat drink it. Here is a video of my dog drinking it. Wait 30 minutes before feeding breakfast. If your pet won’t drink the above concoction, you could try a supplement. Prior to learning about the detox drink, I gave my dog a liver detox supplement 2 x’s a year, for 28 days each time. This is a Liquid liver detox herbal remedy. 4) B-12: great for thyroid, anxiety, helps heal the neurological system and aid in recovery from physical injuries. 5) Stress Relief: This may help you and your pet adjust to all the changes you made to deal with trying to shrink the lipoma. Taking something natural helps take “the edge off” while keeping you functional. This version is specifically for pets. Keep in mind, this did not happen overnight and will not go away overnight. Consistency will be key! In part two, I will discuss diet, herbs, and spices known to shrink or prevent lipomas. Other articles that may interest you: Teflon free toaster oven is safer for your pets, non-toxic cleaning and fight fleas naturally!